Dizzy is made from a white material covered in multicoloured spots. He has black button eyes and a black nose. His floppy ears are made from a black material and he wears a blue and white checkered ribbon tied around his neck. Think I’ll see what I can do! Dizzy was released on 19th June 2001. His birthday is on 7th October 2000. Dizzy is a dalmatian breed of dog. Dizzy with black ears, coloured spots and a blue and white checkered ribbon (this version). Dizzy with black ears, black spots and a red collar. Dizzy with black ears, black spots, a black tail and a checkered blue and white ribbon. Dizzy with coloured ears, black spots and a checkered blue and white ribbon. 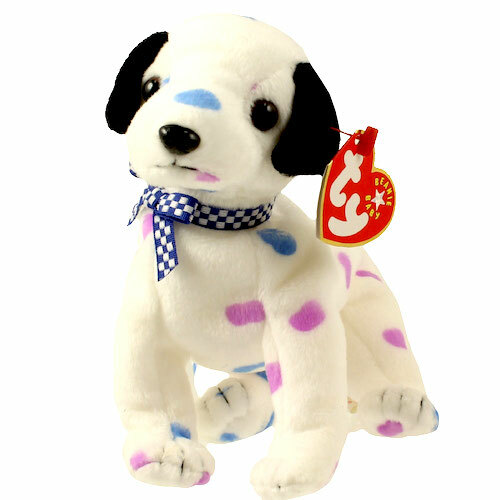 Dizzy with coloured ears, coloured spots and a blue and white checkered ribbon. Dizzy key clip with black ears, black spots and a red collar. Dizzy retired on 8th August 2001.